Hi. Great example. Thanks for posting it. I suggest using MaximumValue = 1023, so that when the ADC input is at 3.3V, the float will return 3.3. Otherwise, you'll get 1023/1024*3.3 as a result. In practice, my Netduino is showing 5 - 8 lsb of noise, so this probably won't matter to most users. I'm just off to check the sample-hold time in the ADC code to see if the noise can be improved. Hi, thanks. And I agree. I've change the code and updated the post. I found 1023 was giving better results, but wasn't sure why. So I decided to stick with the theoretical value in my post. 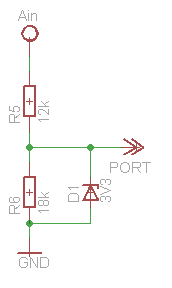 After that I started a thread on the netduino forum, which gave me a better understanding why 1023 results in a value that is closer to the actual voltage. I forgot to update this post. You can find the discussion on the Netduino forum here: forums.netduino.com/.../2216-adc-value-divide-by-1024-or-1023. Thanks for this tutorial. Just getting started with netduino and really helpful.